Ideas and inspiration for creating art with passion! I hope everyone enjoyed creating and viewing my talented friends’ creations this month! 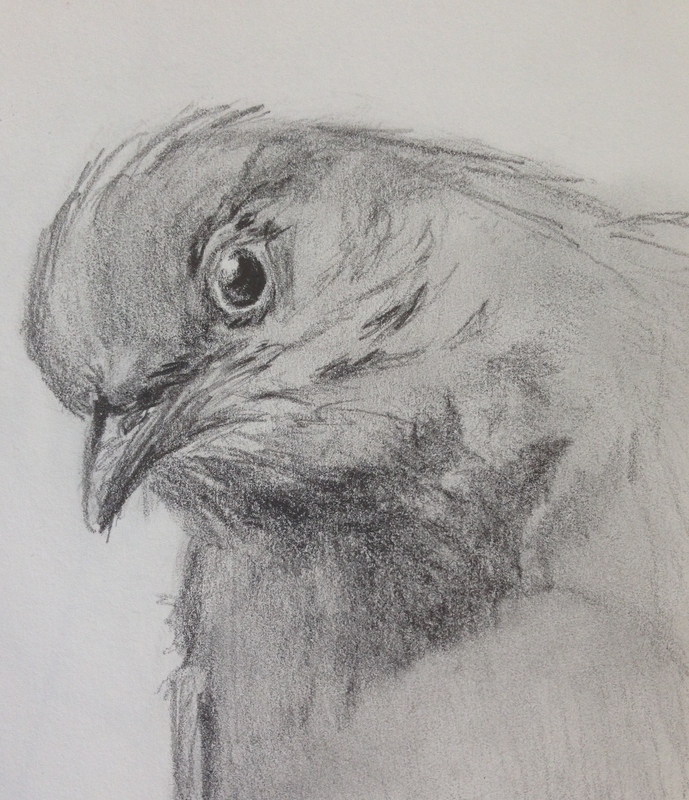 If you posted bird art in August, and do not see a link to your work here, then either I made a booboo, or I did not have a link to your work underneath my August 8 bird post in the comments section. Please add a link to your August Draw a Bird Day post in the comments here, though, and we’ll be sure to add you to the list! I am taking a blogging break, although I hope to return soonish. Are we all celebrating September and the advent of autumn’s flaming colors and cool breezes? You know I am! Peace and Happy Football Sunday to all! Our cameras aren’t super high-tech, but I may be able to share a photo if one of us gets close enough to snap one. Ours is a precious Eastern Cottontail rabbit. 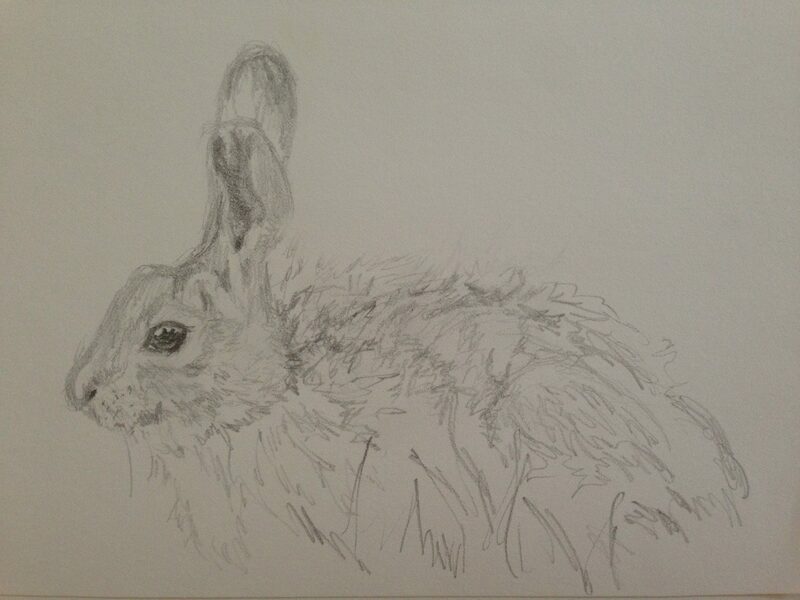 So I’ve become a bit obsessed with rabbits lately, and hope to improve on them in the next couple of months. Speaking of furry critters, I really need to give a shout out to Rebecca Evans at Rebecca Evans Create.com here on WP. This link is to her Hares page, and she is a magnificent artist, rendering mostly animals and birds, but other subjects too, in all mediums: oil, watercolor, pastel, charcoal, acrylics, mixed media, collage, 3-D art; you name it. You owe it to yourself to check out her site. Her horses are spectacular too, but honestly, everything she does is incredible. If I were ever to render an animal, any animal, the way she can, I would consider myself “arrived”. I’ve decided to take a break from news headlines, particularly those about small men embarrassing my country on an all-too-regular basis, take a step back, and set my mind on things that are above, and that will fill up my peace tank, like God, nature, birds, bunnies, sunsets, flowers, trees, and beauty, wherever it lies. So, not a break from art, but a break from pretty much everything else. I need to really clear some space for prayer, yoga and meditation, things that will relax me and bring me to a healthy and more balanced place. You may see me here and you may not, but hopefully I’ll have a post for Draw A Bird Day on Monday, the 8th! I’ll be doing a roundup post, as well, with links to everyone’s bird art about a week or so after the event. Susan at Susan Feniak’s art contributed a watercolor heron too! I want to thank all of my talented friends for helping WordPress fly once again! I hope you all enjoyed the artwork from my talented friends this month! 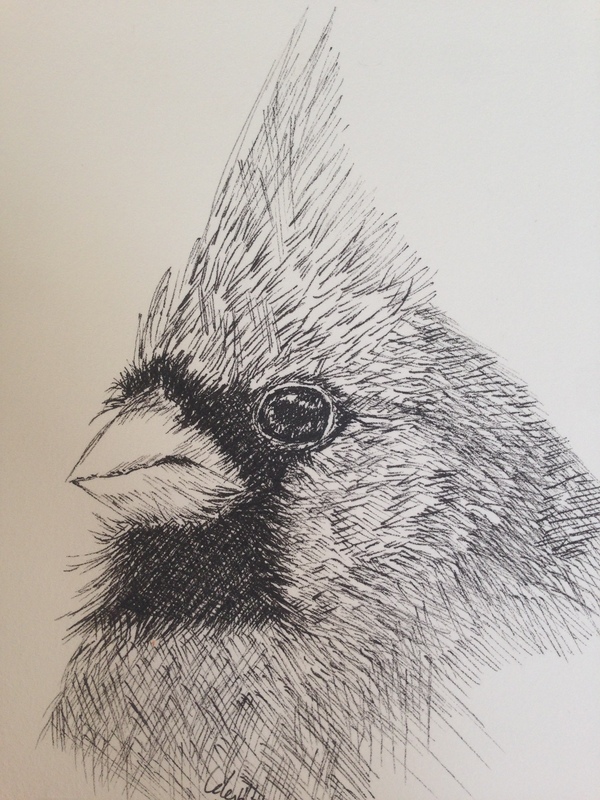 If you posted bird art and do not see a link to your work here, then I did not have a link to you or your work underneath my June 8 bird post in the comments section. Please add a link in the comments here, though, and we’ll be sure to add you to the list! Happy Almost Weekend to all, and enjoy the birdies today. Peace. A Friend for Life (in Between): 100 Face Challenge #63! 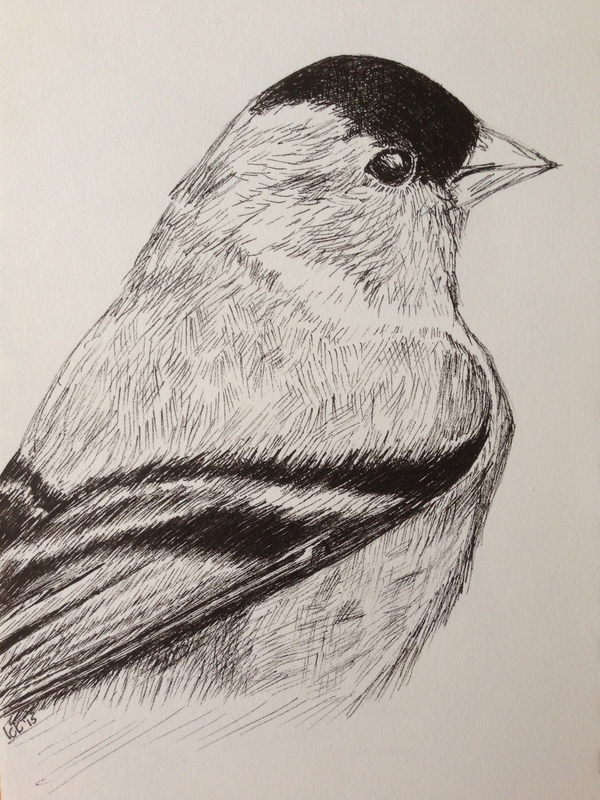 Ever since drawing one of Kathy’s blue jays in ink for June’s installment of Draw a Bird Day, I’ve been drawing more than painting. Pointy implements, please! I couldn’t resist a recent photo of Jodi’s dog Charlie at Life in Between over breakfast….and by dinnertime, I was off to try this photo from last September as well. I dare you to resist these gorgeous images of a soulfully beautiful animal! I enjoy drawing animals, dogs in particular, very much. Their whole life and all of their love sits in their eyes, and what could attract an artist more than that?! Hub and I love baseball, but it’s not always the most action-packed event on TV. 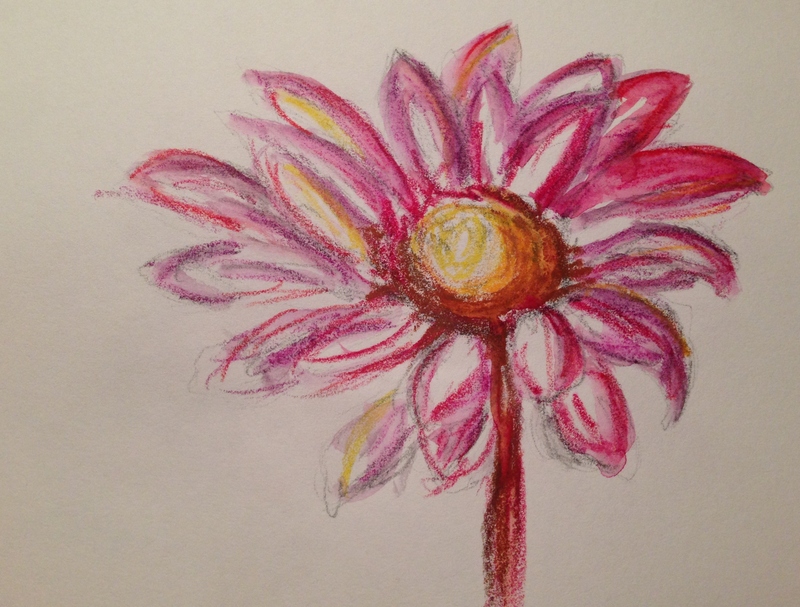 So I’m sharing last night’s “fun in the sketchbook while watching TV” with you this morning. This was done with a 4B pencil in a sketchbook recommended to me by Kirk at Dumb Sketch Daily. It’s called a Universal Sketchbook and it’s made by Canson. And I LOVE it! Why? It’s 100 sheets (so, 200 pages) long (longer than most), it’s inexpensive (currently $4.50 at Blick for the 8 1/2″ x 5″ size, perfect for drawing in my lap, as I love to do), lightweight, and it works well for pencil, ink, colored pencil, conte or charcoal, even light watercolor washes (as shown here). I think what I love the most about this book is that it’s so inexpensive that I’m not afraid to “waste” it. I will try subjects that are way too big for me. I’m not afraid to make an ugly drawing or waste the beautiful paper or mess up the lovely book I bought. You know? Yet, it’s an inviting surface that works well for most mediums, so I often surprise myself by how the sketches turn out. Jill of Jill’s Art Journal encouraged me to keep a daily art journal last year, and that tip led to daily drawing nearly every day since last May. You would only need 2-3 of these little books to take you all the way through the year (I often use the backs of the pages too), and it’s a nice little companion that travels well. It’s spiral-bound, with perforated pages. What’s not to love? I wouldn’t have even attempted a foreshortened pose like this last May. Now, it’s a fun challenge. Perfect result? Heck no, but I’m steadily improving with a daily practice. If you try this, please let me know how you’re doing with it! If there is anything I can help you with, I will. Since having a child over 25 years ago, nothing has changed my life more than a regular art practice. It will heal and transform you in ways you can’t expect – all wonderful! I shall jump off my soapbox now, but I just had to get this out there! Jodi, thank you for sharing your photos of your lovely Charlie. Peace and a happy, creatively wonderful weekend to all! Happy March reprise of Draw A Bird Day! 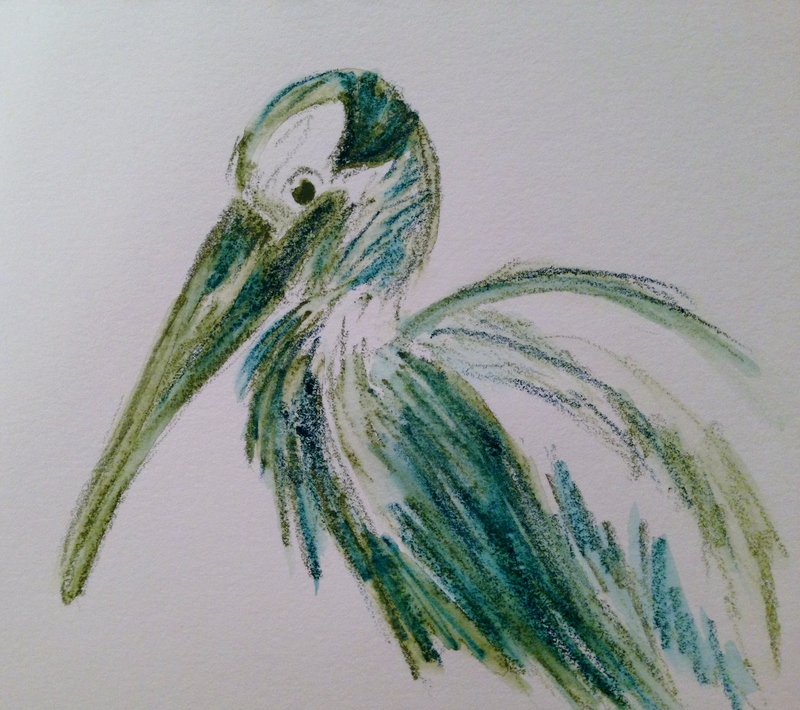 Time for art is running short these days, but I was recently inspired by a photo of a wood stork by Donna at Bay Photos by Donna and had to try a quick sketch in Neocolors after work last night. Thanks again for the inspiration, Donna! I also want to thank Kerfe and Nina at Method Two Madness for hosting DABD once again this month. I hope everyone is enjoying an early spring with warm breezes and the promise of tulips just around the corner. Peace. Sometimes a photo of an animal immediately grabs me and I must draw it right away. 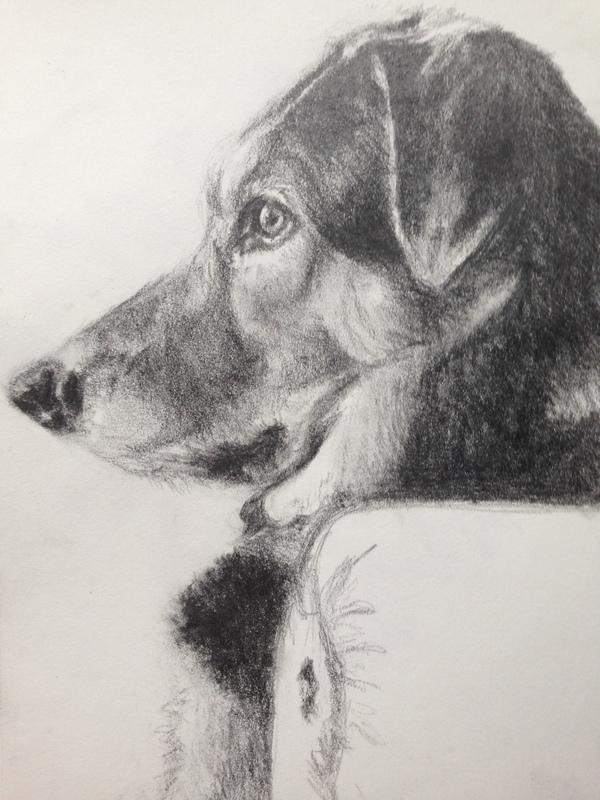 Johanna at Colorpencil2014 recently shared a gorgeous photo of her dog and I jumped into it right after dinner last night. What a stately, gorgeous animal! I thoroughly enjoyed my time spent with this beautiful dog and my mixed media art journal last night. Thanks so much for sharing your photos, Johanna! I hope you enjoy! Happy Weekend to all! I hope you make some time to do something that fills you with joy and satisfaction today. Peace. I recently discovered a new blog called Broken Castles here on WordPress, and the images and poetry there are quite poignant. Aries graciously gave me permission to use this black and white photo as a reference for my artwork, and so here is my loose interpretation, in the colors I love best. 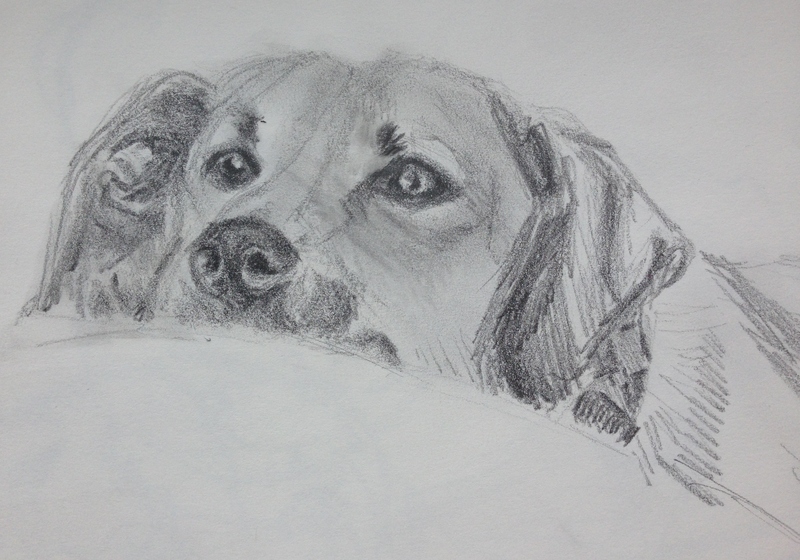 I started with an underdrawing in 2B woodless graphite, and then added (you guessed it!) Neocolors. If I would have been going for a realistic result, I’d have chosen a different medium entirely (and paid more attention to form lol), but the Neos once again allowed me to quickly capture my feelings about the subject and get them down on paper. This is why I love them so. Thanks, Aries, for allowing me to use your lovely image! I hope you enjoy, and that you’re anticipating the weekend with twitching tailfeathers! Peace. Could Easter be on its way?! Maybe, now that there’s a frog on the screen. One never knows. 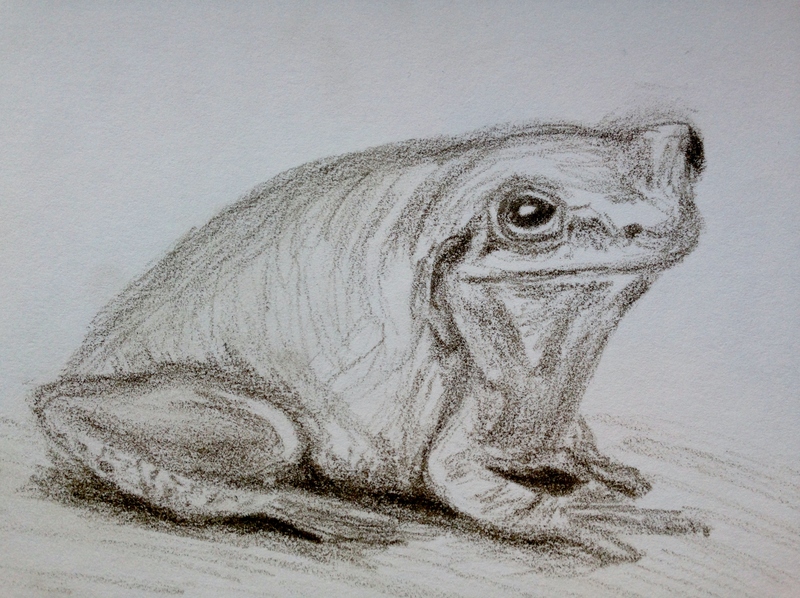 I want to thank my friend Donna at Bay Photos by Donna for a wonderful reference photo of my little amphibian friend. I’m so inspired by my photographer friends here on WordPress! 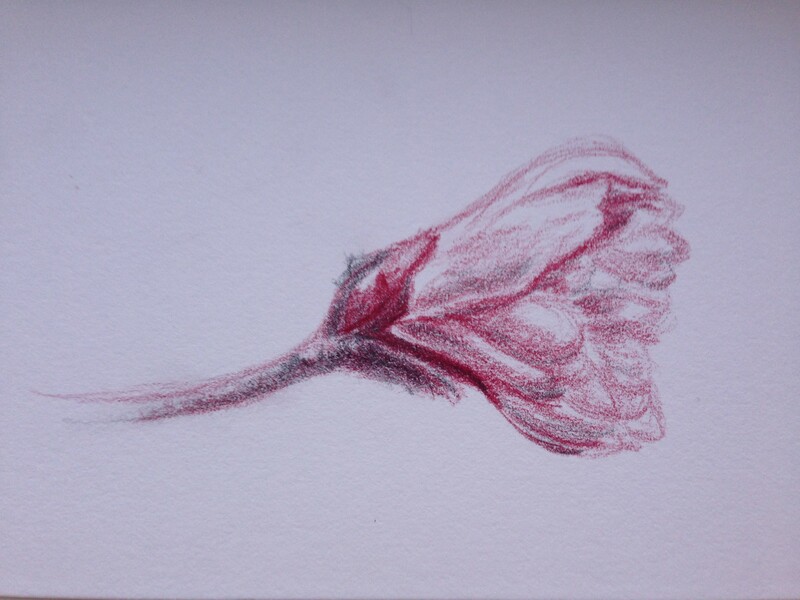 This was done with a Derwent drawing pencil, as it was the closest thing around. I really enjoy drawing with them, love the buttery smoothness, but I wish they erased better. That’s what I love about the Polychromos colored pencil: you can erase almost every color they make, unless it’s really dark. Nice bonus when working in color! Happy, hoppy Thursday to all! Peace. I hope you enjoy. The crocuses are blooming and Lady Spring is indeed on her way. I will likely be blogging less often between now and April 15, which is my busy season in the office. I hope you’re enjoying the blossoms wherever you are. Peace. Enter your email address to follow my progress and receive notifications of new posts by email! Purchases support my site. Thank you! Freedom: Welcome to World Watercolor Month, Day One! Happy (Belated) Draw a Bird Day!